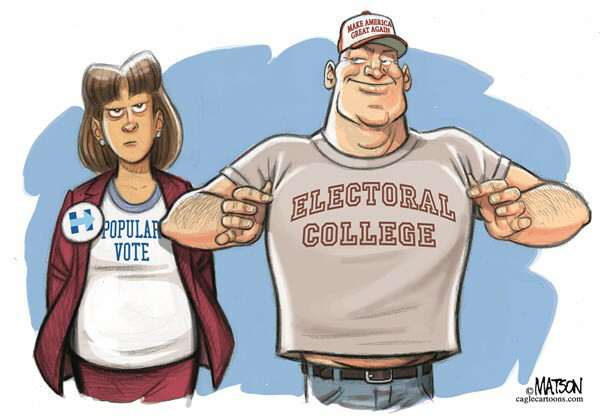 For those of us scratching our heads trying to figure out how to defeat Donald Trump in 2020, there is really only one place to look: the Electoral College. As we know, Hillary won the popular vote by some 3 million, but lost in the Electoral College by 74 votes (306 to 232). A candidate needs 270 electoral votes, out of 538 electors, to be elected president. Each state has a number of electors equal to its Congressional representation (two senators and one for each member in the House of Representatives, with the District of Columbia allocated three electors). This is an anomaly in our political system. Every other election in the country (local, state, federal) is decided by a majority vote of registered voters. Electors, on the other hand, are nominated by the political parties in each state, choosing potential electors (often based on political patronage) before the general election. On Election Day the winning presidential candidate’s slate of potential electors are appointed as the state’s electors (except in Nebraska and Maine, where the winner receives two electors, and the winner of each congressional district receives one elector). The Electoral College was a compromise. Having the legislature elect the president was rejected on the grounds that the two branches of government should be independent of one another. Electing by popular vote was rejected on the basis it would give the most populace states a political advantage. The compromise, however, was flawed and indelibly stained from its beginning. It counted slaves, who had no rights and could not vote, as three-fifths of a person. At the time of its creation, a full 40 percent of the South’s population was enslaved. The majority of our new nation’s citizens lived in Northern cities like Philadelphia and Boston as compared to the more sparsely populated South comprised of plantation owners, farmers, and slave laborers. In a direct election system, the South would have lost every time because a huge percentage of its population (more than half a million) were slaves who couldn’t vote. However, in an Electoral College where states could count slaves as three-fifths of a person, the South developed a collective advantage. Indeed, by voting as a block, the South enabled Thomas Jefferson, who owned more than 100 slaves, to defeat John Adams, who opposed slavery. And, four of our first five presidents were from Virginia, the largest slave-owning state in the Union. This advantage, cobbling swing states into 307 votes in the Electoral College still exists, accounting for President Trump’s election. Rationally, the Electoral College should be abolished. Indeed, the majority of us do not support or approve of it, preferring by a margin of roughly 2:1 (65 percent to 32 percent) direct presidential election by popular vote. Nevertheless, while it is appropriate to work for its abolition, it’s unlikely this will happen. Two-thirds of the House of Representatives and two-thirds of the Senate would have to abolish the Electoral College, and then three-fourths of the states (38) would have to ratify the amendment. (Not likely to happen.) So, with 2020 barreling down on us, and understanding that the Electoral College gives disproportionate power to the more thinly populated states that “elected” Donald Trump, we need another solution. If Trump is to be defeated in 2020, Californians shocked (and horrified) by his presidency are going to have to: support a Democratic candidate who during the primaries shows that she or he can defeat Trump regardless of their positions, and not vote for a third party candidate over a Democrat (if the votes cast for Green Party candidate Jill Stein in 2016 had gone to Hillary, she would have carried Wisconsin and Michigan), and become involved in “swing state” Electoral College politics. If all the states that voted for Hillary hold (which they should), based on the 2018 “Blue Wave,” the following states could be flipped, totaling 295 electoral votes and a Democratic president. Arizona elected its first Democratic senator in 30 years, picked up a seat in the House along with three statewide offices. In Iowa, Democrats flipped two Congressional seats, the Democratic Attorney General was re-elected, and the Democrat won as state auditor. Wisconsin defeated its Republican governor, re-elected a Democratic senator, elected an Attorney General, and flipped the Treasurer’s office. In Michigan after eight years of Republican control, the Democrat won the governor’s race along with all the other state-wide offices, including re-electing a Democratic senator. And, in Pennsylvania four Democratic women won their House races, the Democrat was re-elected to the Senate, and the Democratic governor was re-elected. Because Donald Trump could repeat the phenomenon of losing the popular vote by a substantial number and still carry the Electoral College, those of us who want to defeat him and are politically active are going to have to do more than just cast our vote. We are going to have reach out to the Democratic political infrastructure in “swing states” and give money, volunteer at the phone banks, help with online and direct mail campaigning, and, if one has the time and money to get there, walk precincts. In the time of Trump it is no longer sufficient to just cast our ballot in California, a state that will give its 55 electoral votes to the Democratic candidate irrespective of who that candidate turns out to be. Remember, the Electoral College has five times “elected” presidents who did not win the popular vote: Andrew Jackson in 1824 (who “lost” to John Quincy Adams); Samuel Tilden in 1876 (to Rutherford B. Hayes); Grover Cleveland in 1888 (to Benjamin Harrison); Al Gore in 2000 (to George W. Bush); and Hillary Clinton in 2016 (to Donald J. Trump). We can’t allow this to happen in 2020.